Perfect gift for my grandmother who worked as a postal carrier until she retired. Perfect! Love how delicate the necklace and earrings are! Love the set! Good quality and workmanship! I was very happy with my necklace upon opening the package. I love it! Very unique and easy to wear. I love my new necklace. It is so unique......I bought one with stamps from the US. I wear Americana jewelry all the time and look forward to adding this piece. Great price. My mother loved her necklace. My third purchase from Postali!! Will purchase again!! Not sure if I missed the size of the pendants, but they are really tiny so hard to tell what they are; otherwise, well made and pretty. My wife loves it, Just wish it was larger and abetter clasp. Bought 4 necklaces. everyone loved them. another very different and unique idea. i wish the pieces were just a little larger. as people inquiring seemed to take a long time to understand and see that they were stamps.. still great idea. I really like them. I do wish they were a tad bigger though. They're something different & unusual. I'm not crazy about the chain they are on but I can always get a different one if I want to. Postage stamps are unique and one of a kind. Why let old stamps go to waste when they can be created into marvelous works of art? At least that’s what Kelsey Norris was thinking when she created her line of Postali Jewelry. 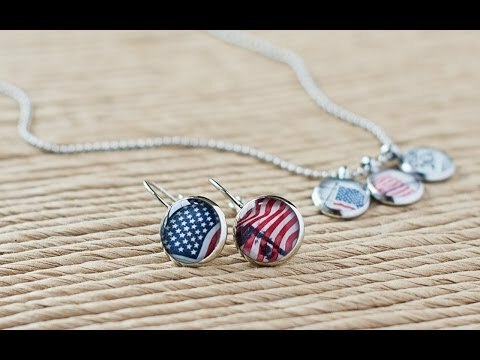 Kelsey handmakes her pendants and earrings by choosing a stamp that is based on its color, design, and country of origin. 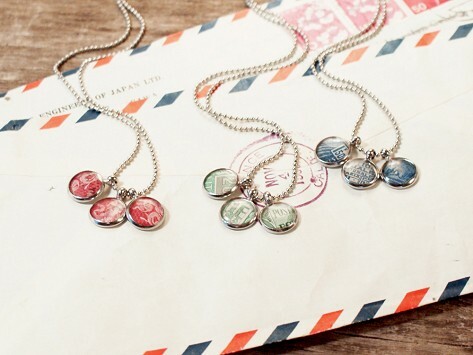 The stamps are then cropped to fit the jewelry and are sealed with resin instead of glass to make the earrings and pendants appear more vibrant and to ensure durability.